Powers/Abilities: He could cause explosions by concentrating on something or by accident through extreme emotions. History: (Muties#6 (fb)) - Teenage boy Liam Connaughton was a mutant with explosive powers he didn't know how to control. One day he blew up a building by accident. Colin found him wandering around nearby and Liam couldn't stop telling him that he didn't want to do it. Some time later it happened again when Liam blew up a van. (Muties#6) - One morning a dream ended with Bridget's hand touching him. She asked him to be quiet because nobody should find out about their relationship. Liam got his breakfast and then went out to feed the pigs. Then he went with Bridget to a field and he accidentally blew up a field nearby when they kissed each other. Many sheep were killed in the explosion and Liam stayed quiet while the Bridget was interrogated. Liam was brought home by Colin who visited him again in the night to talk with Liam about his dead father and his responsibility to do something for his country. The next day Seamus pushed Liam into his car and Liam became so afraid that he blew up the car's engine. Bridget continued to visit Liam in the morning and his mother was happy that they were a together. He told Bridget that he was different, but she didn't know what he really meant and calmed him down. Seamus and his men returned and drove Liam into the city where he should kill a politician, but he only destroyed a crane and a statue with Seamus' knife at his throat. He was given another chance by Seamus on another day. Liam was taken to a hill nearby a church and Seamus asked him to blow it up, but Liam didn't want to do it and this time not even a gun at his head could convince him. Liam saw Bridget and his mother running towards them and blew the area was in up. Liam survived the explosion and was taken to a hospital in a body bag. Heavily sedated he was kept at a clinic. Wiser men decided that he was an uncontrollable weapon that had already fallen into enemy hands. An army officer ordered Liam's execution. A poison was injected and with his last breaths Liam dreamt of Bridget. (X-Men Legacy II#13 (fb) - BTS) - Liam was saved from the Ministry of Defence's euthanisia program. (Muties#6 - BTS) - After he allegedly died a body was released and he got a normal funeral. (X-Men Legacy II#13 (fb) - BTS) - To keep his survival secret he was kept off the grid by the government. (X-Men Legacy II#13) - Observed by Pete Wisdom Liam met with Chamber and Legion at a bar. Pete followed them inside and was surprised that Legion had also invited Alchemy, Lila Cheney, Psylocke and Pixie to the bar. While Legion increased the powers of his fellow mutants, who had agreed to work with him, he kept Pete, who didn't trust him, trapped in an illusion wherein the meeting ended with everyone leaving because nobody, including Liam, trusted Legion and wanted to work with him. 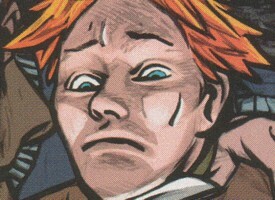 After Blindfold seemingly Pete from the illusion he woke up back in the bar and Legion sent his mind-controlled allies, including Liam, to assault Pete. During the fight Blindfold enabled Pete to see the psychic links Legion had created to allegedly control the others and Pete used his plasma knives to cut the connections between Legion and his pawns and then slay Legion....Blindfold and Pete were unaware that they were still inside Legion illusion. (X-Men Legacy II#14) - Legion sent Liam to a meeting with the queen. Though Pete believed the queen was in danger because Liam could blow her up just by thinking about her, but the former Northern Irish independence fighter Liam ultimately overcame his hatred for the Queen and what she represented and politely shook her hand. The meeting was broadcast and commentated by Lila Cheney for Legion's campaign to show how Great Britain was better with mutants. (X-Men Legacy II#23) - Liam was among the mutant minds Legion absorbed to unite all mutantkind. (X-Men Legacy II#24 - BTS) - Legion returned all the absorbed minds to mutantkind, then erased himself from reality, though he left behind a portion of himself inside Blindfold's mind. It is never stated if the terrorist group Liam got involved with were Catholics (IRA) or Protestants (UVF, UDA, LVF). There are a few sites on the net that have more information on the political/religious driven conflict in Northern Ireland. She was Liam's girlfriend and Colin's sister. One day a field near her blew up when she kissed Liam. She wasn't hurt at that incident and couldn't help the police because she didn't see anything suspicious. She continued to visit Liam in the morning for a good morning kiss at his window. One night she overheard a conversation between Seamus and her brother about Liam. She asked her brother to stop their plan, but it was already out of his hands. The next day she went with Mrs. Connaughton up the hill where Seamus and his men were waiting with Liam to cause an explosion in the church nearby. From far away she saw how everything was blown up on the hill. She was dragged away by the police after the explosion. Liam dreamt of her when he died. He was Bridget's brother and a member of a terrorist group. Three times he saw Liam leaving the scene of an explosion. Once he accompanied him home and Liam was babbling about not meaning to do it. The third time his sister was with Liam and Colin brought the kids home. That evening he met with Seamus and other to tell them about his assumption. Colin visited him, talked about Liam's dead father and then told Liam that it was now his turn to do something. Colin met again with Seamus and others and tried to talk them out of using Liam. The next day they tried to abduct Liam and he blew up their car's engine. He seemingly was the driver at their first successful bombing with Liam at their side. Later that day he told Seamus that they shouldn't use Liam anymore, but Seamus didn't want to listen. Bridget overheard their conversation and Colin told her that it was out of his hands. The next day Colin met with the other terrorists on the hill near a church they wanted blown up. Colin was still against this attack and nearly became a victim of Liam who caused an explosion at the place they were. Colin survived, was brought to a hospital and incarcerated after his wounds were healed. She was Liam's mother. Her husband died years ago under unknown circumstances (he was probably a terrorist). She took care of her son and led a farm small farm with his help. She was happy that Liam found a girlfriend with Bridget and everything seemed fine. One day Bridget told her that Liam was forced into a terrorist group. Together with Bridget she went to the place of the next attack and saw from far away an explosion on the hill. After the explosion she was dragged away by the police and told that Liam was dead. He was the leader of a small terrorist cell in Northern Ireland. Members of his group were Colin and a bald, unnamed guy. 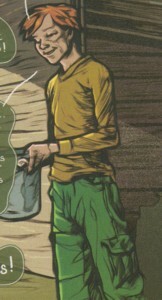 Seamus wanted Colin to interrogate Liam when Colin told him that he was perhaps involved in the recent bombings and wanted to recruit him when he learned that Liam was perhaps a mutant. The first time Seamus and his men tried to abduct Liam he blew up their car's engine, but the next time it worked fine. They drove with him into the city and Seamus ordered him to kill a politician while threatening him with a knife, but Liam only blew up the crane and a new statue was destroyed. Seamus wasn't happy with that, but he wanted to give Liam another chance. That night Colin asked him to stop using Liam, but Seamus only threatened him and wanted to continue with their plans. The next day he met with everyone at a hill nearby a church. He threatened Liam with a gun and told him to blow the church up, but Liam caused an explosion at the place they were. Seamus seemingly didn't survive the explosion.